Snickers and Butterfinger in a COOKIE. 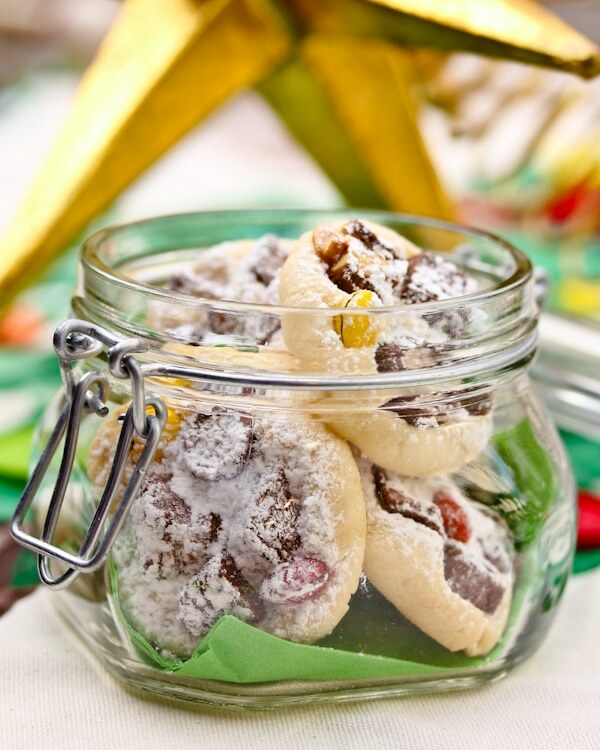 Offer these incredible Candy Bar Cookies at your cookie exchange this year. 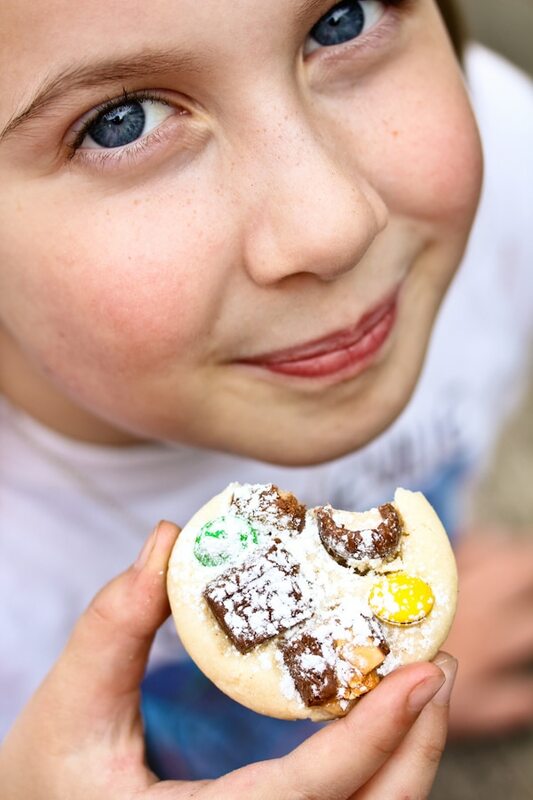 Candy Bar Cookies = Big Smiles, scout’s honor. So you consider yourself environmentally minded? You like to reduce, reuse, and recycle. Well baby, this is recycling at its best. You probably have a bucket of leftover Halloween candy shoved back, high on a pantry shelf, that you’ve been rationing out, one piece at a time, for the last month. This year, recycle those miniature chocolate bars into your Holiday Cookie Exchange offering. 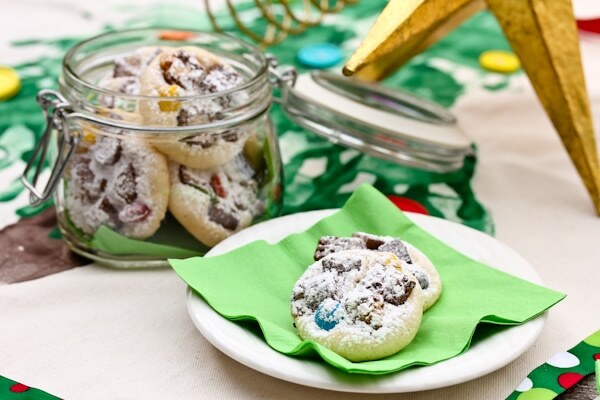 Your kids will be happy to donate their old candy to make these amazing cookies. See? These are the faces of happy campers. And let me tell you, these two are authorities on the makings of a good cookie. 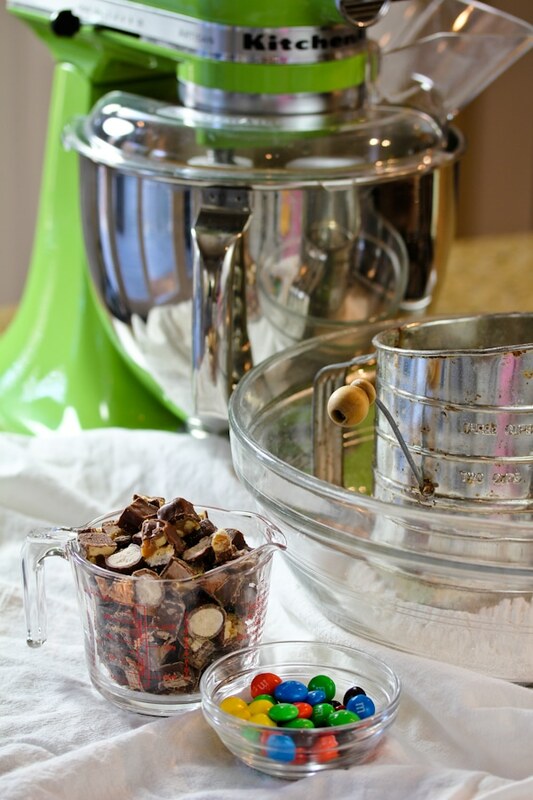 We simply chopped miniature candy bars (and Whoppers) into small chunks, about the size of our leftover M&Ms. Then we pressed 4-6 chunks and M&Ms into the top of cream cheese cookie dough balls. This dough in out of this world. Light and tangy with a delicate texture that holds its shape well. 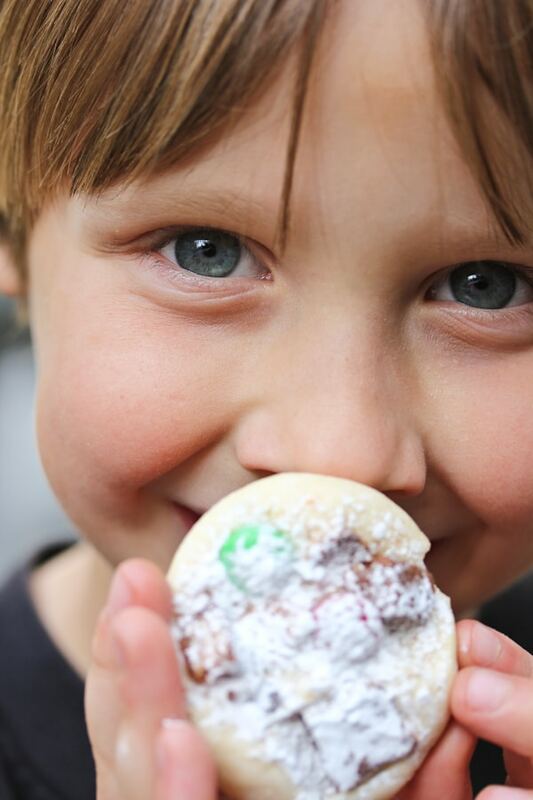 Once baked and cooled we sprinkled each cookie with sugary “snow” for winter appeal. Voila! 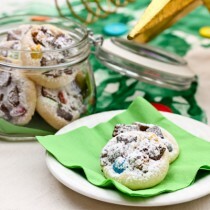 Recycled Candy Bar Cookies that will take the prize at your holiday cookie exchange. Preheat the oven to 375 degrees F. Line two cookie sheets with parchment paper. 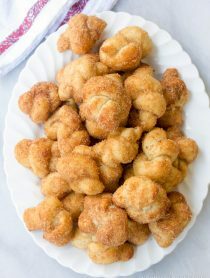 Using an electric mixer, beat the butter, cream cheese, vanilla, egg yolk, and sugar until light and fluffy, 3-5 minutes. Sift the flour and salt together. Turn the mixer on low, then slowly add the flour to the butter mixture. Roll the dough into 1/2 oz. (1 Tb.) balls and place the the cookie sheets. 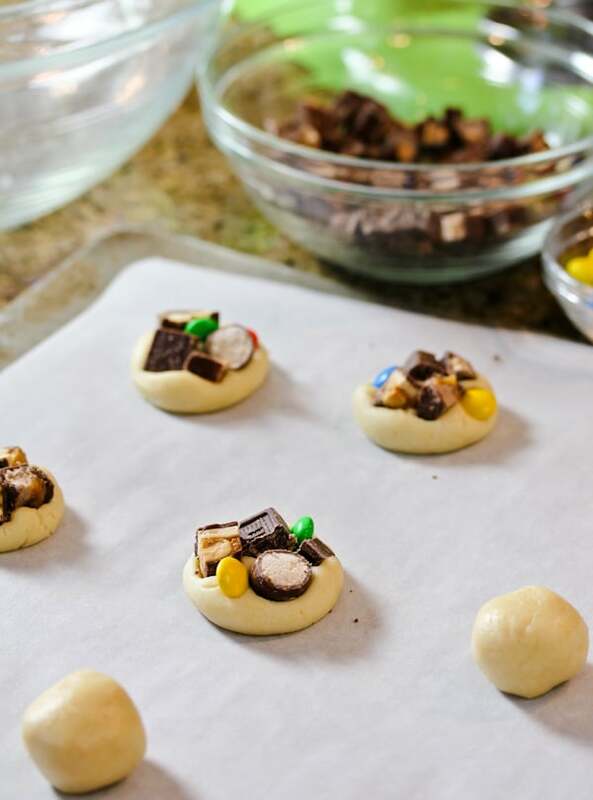 Press 4-6 candy chunks into the top of each dough ball. Press to flatten. Bake 9-11 minutes. Cool on the baking sheets. 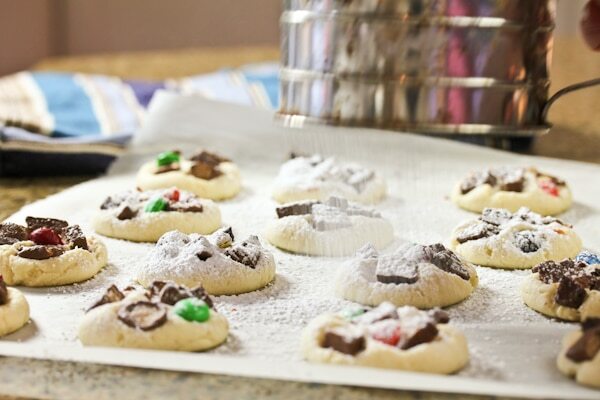 Once cool, dust the cookies with powdered sugar. This is such a great idea! I still have Halloween candy to use, going to have to do this soon with the Halloween and Christmas candy we now have! I wish I had known about this recipe! I actually used my leftover candy in a bark this year. I will be bookmarking this for next year! They look absolutely delicious! Seeing those adorable little ones with these AMAZING cookies made my evening all the brighter. Thank you for sharing them with me. I hope you have a blessed week. 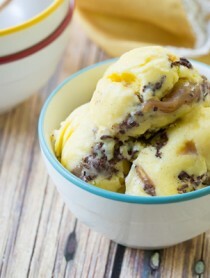 didn’t even take adorable kiddos to convince me that this recipe was a winner…but they sure made a sweet addition to the post! I don’t know if I am going to be able to get this out of my head till I make some. No leftover candy from Halloween. That didn’t last long. No worries though I would be glad to go out and get some more. This is exactly what I need to do with our leftover Halloween candy. I love the photos of your happy campers. Great reuse of leftover candy! Great idea for leftover candy. I would just go buy little candy to make these. Those look great, and I love your presentation! Great pictures! What a great way to use little candies. 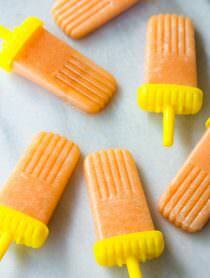 My kids might love me even more if I made these! The kids look so cute! They seem to really enjoy the cookies. Who wouldn’t anyway? These are te chocolate candy bars we have grown up loving. I love the creative way of cooking them into just 1 cookie recipe. Thanks for sharing! I stashed away some of the Halloween loot just for cookies like this! What a brilliant idea – love it! Oooo, these make me wish my older kids were still young enough to have trick or treated and my youngest was OLD enough to have gone! They look yummy! This sounds like a great and yummy idea. 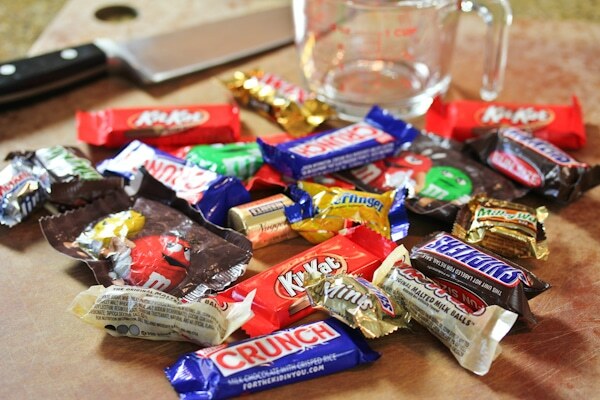 I don’t have any candy leftover from Halloween because I gave away every single piece! We must get 200 trick-or-treater’s. (Thank heavens!) Have a wonderful weekend. I’ve already had Butterfinger and Snickers in cookies. Some of the others would be mighty tasty too! I have seen many versions, but yours are definitely the prettiest. These are awesome. GREAT idea! Yes please, I’ll take a dozen! These are TOO tempting!!!!!!!! Ridiculous. These are so fun and yummy sounding! Love it!